Two weeks ago Wendy gave me a book she picked up during her trip to Oxford. She said it is part of a series in which contemporary authors incorporate myths into their narratives. This one involves Oedipus and Sigmund Freud. Oedipus and Freud are two of my favorite characters, so I was interested, but when I saw the title - Where Three Roads Meet - I knew I had to read it. Phocis, the territory where the three roads meet, is one of my favorite places in myth. Salley Vickers' story is based on a clever idea: the blind prophet Tiresias comes to visit Freud's study during the days before the great physician's death to tell him the story of the fall of the house of Laius. Thus Oedipus becomes the subject of Freud's last analysis and Oedipus the symbol of Freud's own fate. Tellingly, Vickers does not end Tiresias's tale with Oedipus' downfall, but with his mystical death in the garden of the Eumenides, setting up the image of Freud's death as an equally mystical passing. 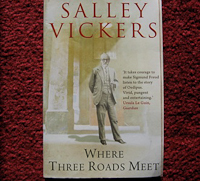 Vickers' story begins in Vienna, but quickly moves to Hampstead England where Freud is living with his daughter Anna. He is dying from the cancer that destroyed his mouth. While Freud sits and smokes, Tiresias tells his story. Freud interjects bits of psychoanalytic interpretation, while the blind prophet educates him in the lore of the ancients. Together they inject new meaning into Sophocles' drama. Throughout her narrative, Vickers stays remarkably true to Sophocles's version of the tale. She needs to have Tiresias stay on after his row with Oedipus so he can relate the events leading up to Oedipus' discovery, and she needs for him to hear from a little bird (a nightingale, actually) about Oedipus' final hours, but for the most part Tiresias' story matches Sophocles'. For a student of Greek drama, the fun of Vickers' story is in her elucidations of the areas that Sophocles leaves obscure. She solves the mystery of the protagonists' ages that has been the subject of countless calculations. Vickers' Jocasta was sixteen when she gave birth to Oedipus. He was eighteen when he returned to Thebes, making her thirty-four. They married and had four children quickly. To explain why Oedipus and Jocasta had not talked about the death of Laius until Oedipus began his search for the killer, Vickers re-imagines Jocasta's marriage to Laius. She makes him a tyrant (in the modern sense of the term) with a vicious temper, who refused children because he believed his son would murder him. Jocasta got pregnant only by getting him drunk. As soon as Laius found out, he made Jocasta get rid of the baby. When Oedipus arrived in Thebes, fresh from his bloody victory in Phocis and his triumph over the Sphinx, neither he nor Jocasta had reason to bring up the unpleasant subject of the former king. Freud and Tiresias agree that she must have had some inkling that the man whose bed she shared bore a striking resemblance to her former husband - and was about the same age as her dead son - but she buried the terrible secret inside her alongside her "violently murdered, meticulously forgotten first husband." One question Vickers might have taken on, but didn't, is the sequence of events between Oedipus' encounter with Laius and the servant's request to be relieved of his duties. From Sophocles we know that Oedipus had a run-in with Laius and four of his men at the place where three roads meet and killed all but one of them. The lone survivor returned to Thebes with the story that Laius was killed by a band of robbers. Meanwhile, Oedipus went on to solve the riddle of the Sphinx, marry Jocasta, and take over Thebes. When Laius' servant saw Oedipus, whom he recognized as the killer, he asked to be relieved of his duties and live as a herdsman in the remote pastures of Mr. Kitheron. This sequence of events raises so many questions. How did the servant escape? How long after the event did the servant arrive in Thebes? Why did he say that they were attacked by a band of robbers? When did Oedipus arrive? Why did the question of where and how the former king died never come up? Maybe Ms Vickers will write a sequel.